oDoc is building a revolutionary healthcare platform, that leverages technology and design to provide a vastly improved physician and patient experience. We have won the Commonwealth Digital Health Award for telemedicine. We provide an online platform which connects Patients to Doctors for video consultations. Our aim is to make the world a better place by ensuring that top quality primary healthcare is universally available, affordable, and accessible. Healthcare on demand, anywhere, anytime. We are also the number 1 healthcare app in Sri Lanka, proudly designed and built in Sri Lanka by Sri Lankans for Sri Lankans. LOLC, MAS and Brandix are stakeholders in the company. As an oDoc photographer you are expected to coordinate with doctors and set up appointments to take their photos. Once taken, these photos should be edited and uploaded onto a google drive, and finalised photos should be sent back to the doctors. The photographer will be provided with training, a camera, a tablet and a google form which should be used to collect the doctor details. You should have an outgoing personality with great customer service skills and a lot of patience. • The photographer should be aware that travel is a routine part of the working day, and to this end oDoc will cover travel expense. • Working hours are flexible, but may span evenings, weekends and public holidays in addition to the normal working day. 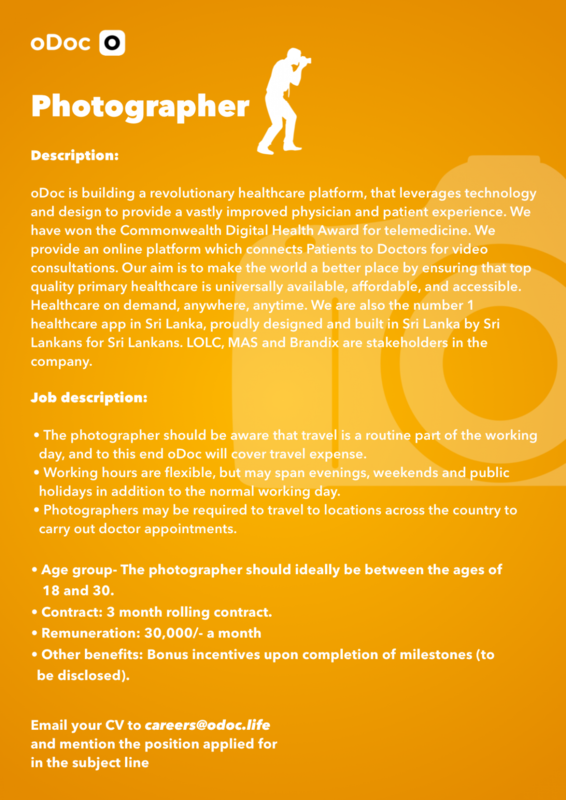 • Photographers may be required to travel to locations across the country to carry out doctor appointments. Age group- The photographer should ideally be between the ages of 18 and 30. Contract: 3 month rolling contract. Other benefits: Bonus incentives upon completion of milestones (to be disclosed).